It’s a big one, a really big one! 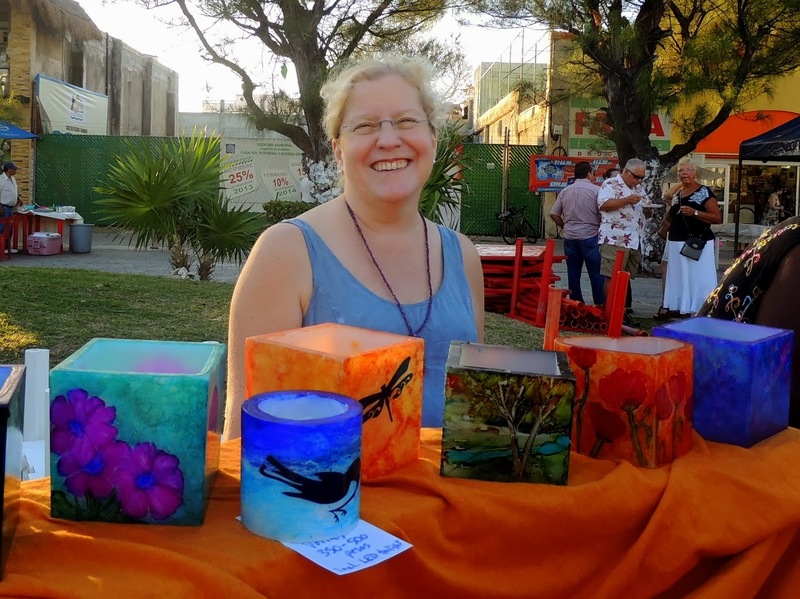 There is lively music, and yummy food, and colourful things to buy; it’s the monthly Artist Fair in the Square showcasing food and any number of beautifully made items. Islanders Tiffany Yenawine Wareing and Bard Wareing have consistently promoted local and visiting artists, organizing a monthly fair to showcase handmade wares. Originally situated outside their Bakery and Cafe on Hidalgo Avenue the idea quickly outgrew its street corner location. Tonight there were seventy-four vendors scheduled to be in the public square. That’s huge! Slowly working our way through the crowd we managed to chat with a few of the artists, purchasing beautiful note cards from photographer Kitty Goldberg, more doggie treats from Bessie Hamaker, and a yummy Moon Pie treat from Rossmery Avila. Besides being a convenient place to find unique items the fair is a handy location to chat and socialize with friends. 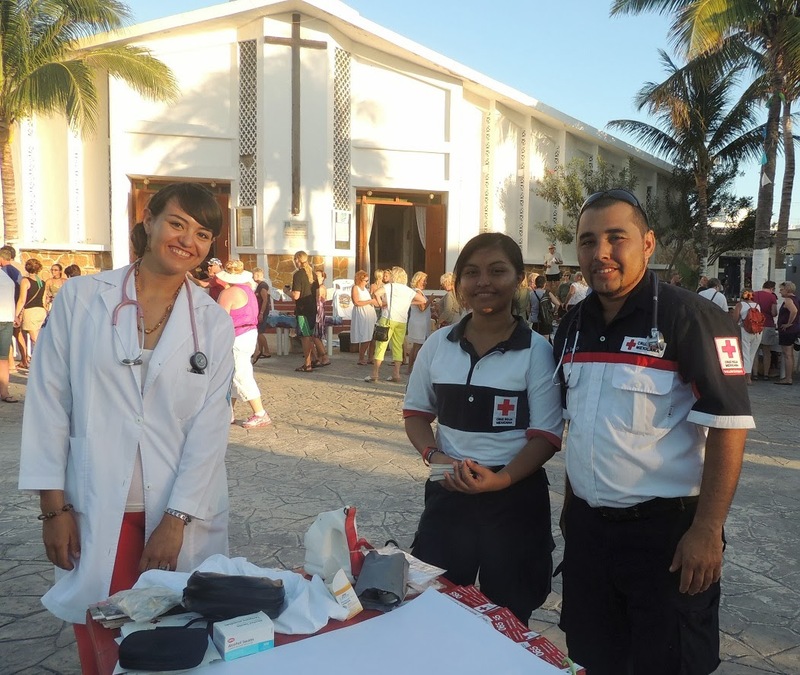 We even had our blood pressure checked by the Red Cross ambulance crew, and met the new doctor who will be working at the Red Cross office. Other artists that I had not seen before included Timothy Fisher from Cornwall Vermont who brought his whimsical acrylic and fabric paintings. Photographer Susan Pacek had her recently published book of photographs that I have seen for sale in a few locations on the island. 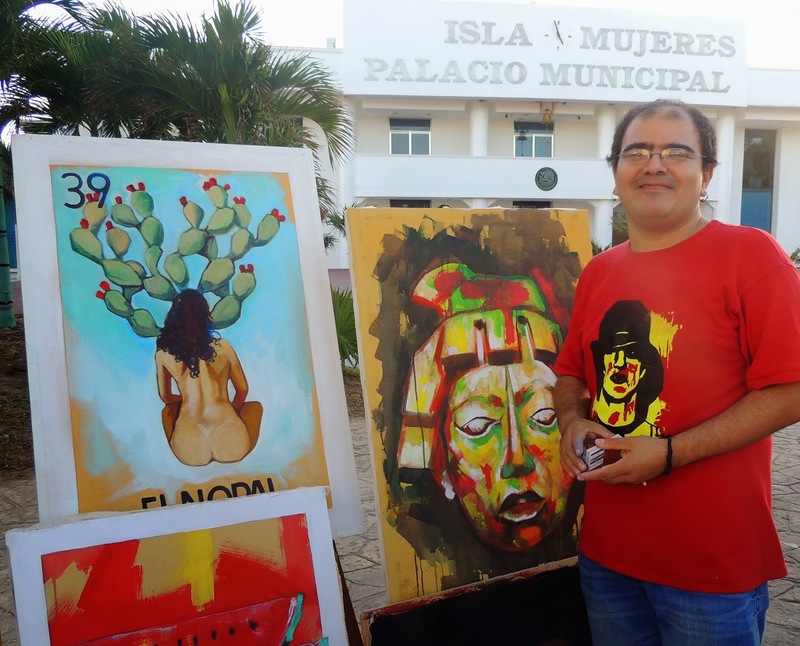 Dhante Loyola, a local artist and instructor, displayed several of his colourful painting. Jan Gerken, a graphic designer, was showcasing an eyecatching collection of note cards and beautiful scarves. New author Penny D. Burnham had several copies of her novel Jaded Diamond. 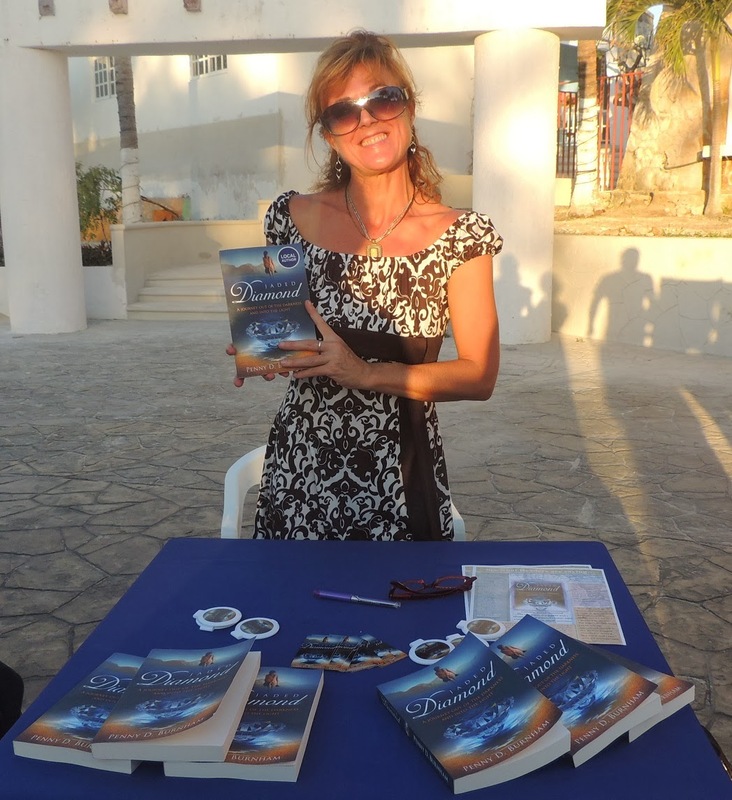 The book is of special interest to islanders as it is set on Isla Mujeres. While we were admiring Betsy Snider’s colourful candle holders and jewelry, I asked if Tony was around. She smiled, and pointed to the top of the church. Camera in hand Tony Garcia, affectionately known as Captain Tony, was precariously perched on the roof. By the time I have this article written, he will have any number of photos already posted to his FaceBook page. Betsy and Tony are getting married next weekend. Sneaking another peak at her soon-to-be groom, I think she was wondering if he was going to be all in one piece for the wedding. In the busy whirl of overseeing the fair, I eventually caught up with Tiffany for a quick chat. 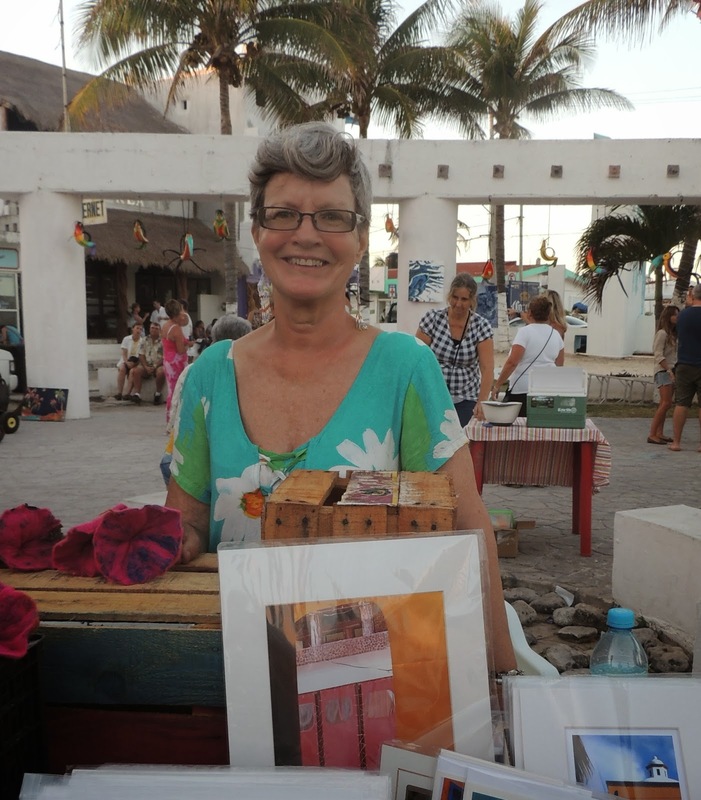 I asked her what her biggest challenge was with creating the Isla Mujeres Artist Fair. 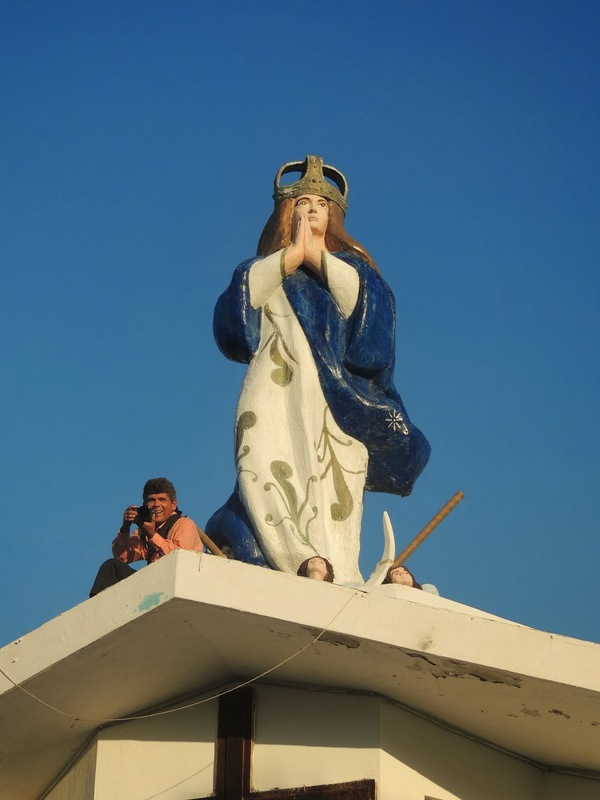 She said it is getting the local population to trust her, and believe in the event. It’s a slow process, but it’s working. Seventy-four vendors! Yep, I’d agree that whatever you are doing, Tiffany, is working. Congratulations to you and your hard working helpers. Such a wonderful event for the island and a special thank you to Tiffany for her incredible efforts to support the local talent(and a big thanks and hug to her husband “behind the scenes” Brad! He is a wonderful support and help as well! I remember when it started out in front of Barlito's and am so amazed to see what it has turned into today…I look forward to participating and attending this wonderful event every month! Sounds delightful. We are looking forward to attending next month when we will be visiting Isla again. It's amazing how the event has blossomed! Kudos to Tiffany and Brad. Saw Tony's photos on Facebook today and went through all of them looking for friends. I noticed two familiar male faces! Hope you have had a lovely week in paradise. We arrive three weeks from today! If you tried to email me last week I never received it. Next PostNext A playdate for adults!